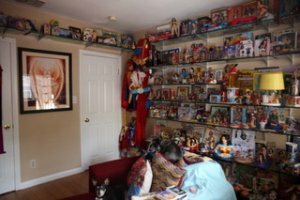 My dad has always said to me … “Viv- you’re definitely one unique character.” And I really didn’t think about why until I had to sit down and write about my collection – my ridiculous Wonder Woman collection & how I live by the code and ethics of my superhero. When I was a little Brooklyn brat, I was obsessed with having Wonder Woman underoos, you know because of the whole Linda Carter being on TV Wonder Woman age. Instead I got batgirl underoos – so I thought I’d try again and I chose this time to be obsessed with a Wonder Woman bathing suit. When we took our big family trip to Atlantic city in the heart of the Winter (to this day I can’t explain why we were there) and my grandparents came along – by grandparents I am referring to my grandmother Sara and her second husband “Uncle Charles.” Uncle Charles was really my step grandfather and he was like a big teddy bear like winnie-the-pooh. 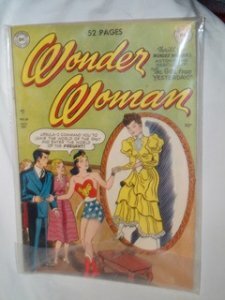 Well, I got sick in atlantic city and was stuck in the hotel, and Uncle charles had remembered me oggling over that bathing suit in the window during the summer and came to my room with my first Wonder Woman comic book – a compilation of a few Wonder Woman comics. OK, so being Orthodox and having nothing to do about every Friday night for my entire childhood but sit by the light of the closet that we were allowed to leave on and read truly tasteless jokebooks and archie comics, I started to read my Wonder Woman comic book over and over and over until the binding ripped, and then duck taped the binding back together and read it over and over and over – you get the point (by the way, silly putty did not pick up the print of this book, only my archie comics did.) I think over time, studying every color – every word … every moment of these pages where Wonder Woman is educating those less enlightened how to treat each other and how to take care of oneself and empowered others to take control of their destiny and basically cleaned up other people’s messes, part of my soul consistently related to Wonder Woman and part of me actually became a “Wonder Woman” as you shall see. I would twirl around in elevators in between floors pretending to turn into her and step off the elevator on my tippy toes pretending I was in her Wonder Woman uniform with 4 inch heels – remember – flat foot Diana Prince – tippy toes Wonder Woman. I would role play Wonder Woman with my friends and tie them with the magic lasso that makes them tell the truth (side note – the author of Wonder Woman was also the inventor of the lie detector – cute,huh). Wonder Woman represents America. Her uniform in itself is American – the top being the American eagle, her shorts the stars of our flag and her colors red white and blue. So I, Vivian, the Jewish tomboy from Brooklyn, finished private Hebrew school, graduated Brooklyn College with a Bachelors in Athletic Training (I was a bodybuilder during those college years – a typical date would have an arm wrestle in it somewhere) and got a Masters In Physical Therapy. I also came down with Epstein Barr Virus (EBV), otherwise known as chronic fatigue syndrome, in my sophomore year of college, but damned in hell if I wasn’t going to do what I needed to do to free myself from my Orthodox community and their multitude of rules. Back then it was referred to as “the yuppie disease” because people didn’t understand what it was. Even my own parents thought “oh, Vivi – you’re just working too hard” but it really was a mono type illness that just stays with you forever until you clean it into remission in some way. So even though I was sooooo tired, my joints ached, and the constant pain I lived with excruciating – I studied for my tests and lost my ability to body build and got through school to get a job that can have me earn enough money to not rely on my family and live how I want to live. You see, when you have EBV you’re given a certain amount of energy at the beginning of the day and you decide how you want to use it – either mentally (studying), physically (staying up) or emotionally (dating). I had to chose daily which one was the priority … mind you with my Wonder Woman will I managed to party through school, teach myself how to ride a motorcycle, date the prince of Morocco, and have timeshares in the Hamptons. I think that’s a cool American story so far, don’t you? But there’s more. I worked in New York once I got out of school and was an orthopedic therapist in NYC for 3 years. I lived in the Village and roller-bladed through the World Trade Center buildings every day to get to work down at the bottom of Broadway. My dad’s office was across the street and we met for lunch. That was the thrill of my day. I love my dad and am so proud of who he has been for this country. He went back to work 3 days after the trade center fell to say F-U to the terrorists. He’s so cool. Proud like Wonder Woman. I moved out to LA in 2000 and I got a job working in the Cedar-Sinai outpatient orthopedic center. I worked there for 3 years while studying for an even further specialization in orthopedic and sports medicine. Then I was transferred to the spine center and created relationships with the doctors there, ones that I have to this date. As a matter of fact, Cedars-Sinai spine center is my primary referral to my clinic to help their patients. After working at Cedars for over 3 years I realized if I wanted to climb the corporate ladder I would have to kill about 30 people that were ahead of me in line or go off on my own. I left Cedars and became director of a Pilates based physical therapy clinic in Brentwood, which later opened a satellite clinic in Beverly Hills. During that time I took a 6 month course to understand how to integrate Pilates into my bag of tricks which I now integrate into my sessions in my own clinic called “Prevent The Pain Therapy, Inc.”- because we don’t just get you better, we point out the patterns that your body has done to keep you in pain and re-pattern you so you never become a patient again – just refer everyone you’ve ever known to come to us. After being Chief Therapist in a Pilates based PT clinic in Brentwood, I started my OWN clinic called Vivie Therapy (www.VivieTherapy.com), which has been growing steadily for the past 14 years. I have a healing facility that integrates some of the latest greatest healing techniques and integrate eastern and western medicine to take the best out of both and help people as quickly as possible get out of their pain to return them to full function. I have molded my life into being a Wonder Woman. I help people and heal them where others have failed. I have been told I am a Wonder Woman by people who were unaware of my fetish. I help people who have been to dozens of other practitioners without relief. I am a stand for global awareness regarding educating people how to PREVENT THE PAIN because our medical field is a piece of … well, you know. Drugs, surgeries, but no solution. I am on a mission of healing the planet and making tremendous shifts of self body awareness and maintenance for a planet that is in a poor state. And no Halloween goes on without me in my Wonder Woman outfit for at least 5 parties. I wonder whether my WW collection helped me become something greater then I was, or whether I was always living into a preordained destiny of becoming a Wonder Woman for my generation. 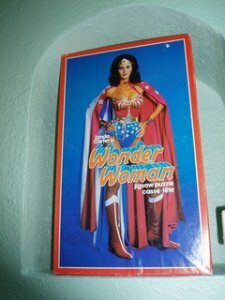 I have the largest Wonder Woman collection that I or anybody I know knows of – including a custom Wonder Woman outfit. When I moved out to Los Angeles in 2000 and got a custom-made Wonder Woman outfit, I had a costume birthday party in February because the costume wasn’t done in time for Halloween. One of the gifts that I received on my birthday was a compilation of items that had Wonder Woman and a lightbulb went off. 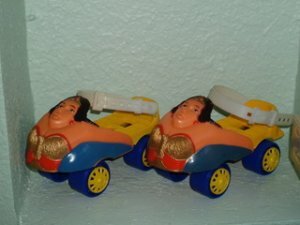 My mother collected salt-and-pepper shakers and depression glass, why not collect Wonder Woman memorabilia? This was also at the time that eBay started. 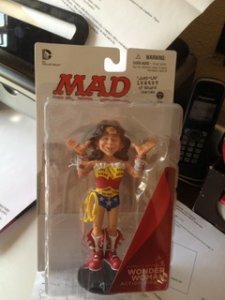 So it wasn’t just about collecting Wonder Woman memorabilia, it was also about winning on eBay. This was before any of those websites that they did for you existed so it became a sport to this athlete. Before you know it we have the collection that I have today. Most of what I own was bought between 2003 and 2006 and now I just go on to eBay periodically and see what they have. Now that the movie is out, my savings are in jeopardy with all the new items for my collection.